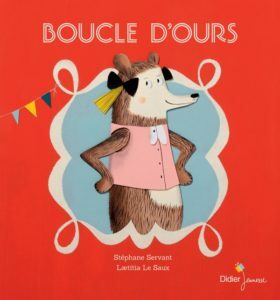 A witty book that undermines stereotypes through the story of Baby Bear, who wants to dress up for the carnival as Grizzlylocks with blonde pigtails and a pink skirt. Daddy Bear is adamant that pigtails and skirts are not for boys, but Baby Bear insists because he just wants to be Grizzlylocks. Then the Big Bad Wolf, all muscles and tattooed biceps, shows up dressed as Little Red Riding Wolf with a red skirt and blonde pigtails. Daddy Bear takes fright and dresses up as Cinderbearlla, while Mummy Bear swaps her Sleeping Bearty outfit for dungarees and a toolkit.